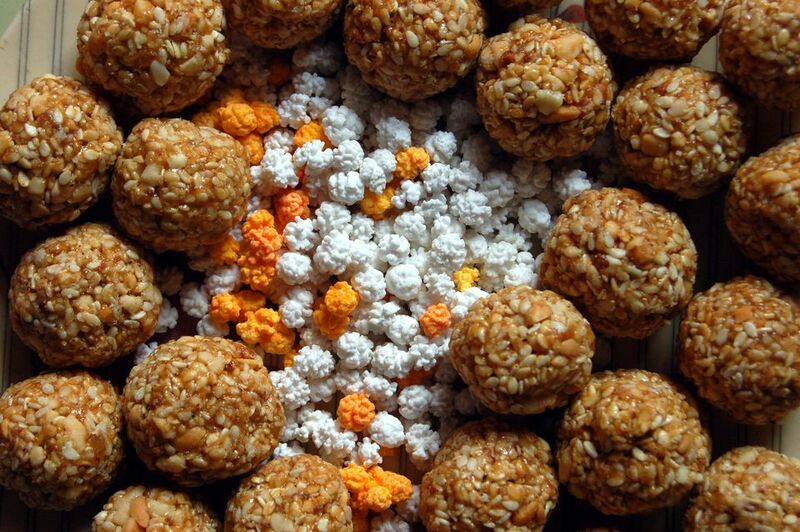 Ladoo, or sometimes spelled laddo or laddu, is the Indian word for any ball-shaped sweet. Ladoo is made with all sorts of ingredients from fruits and vegetables to grains and legumes! This particular dessert is especially popular during winter months as sesame is thought to have heating properties. Here's how you make til ke ladoo. Dry roast the sesame seeds in a flat pan on medium heat. Do this until they are a very pale golden color and aromatic. Put the jaggery and water in a pan and melt to form a thick syrup. To test if it is done drop a little into a bowl of chilled water. If it forms a ball, the syrup is ready. If not, cook some more. Test again till ready. Add the toasted sesame seeds to the syrup and mix well. Add the ghee and cardamom powder and mix well. Take off from heat. Grease your palms and when the mixture is still hot (but cool enough to handle) take enough in your hand to form a golf ball-sized lump. Roll between your palms till smooth. Lay on a greased plate to cool. Repeat till all the mixture is used up. The ladoos will soon harden to candy-like texture.